Identification: Adults can reach 60 to 150 mm in length and 4 to 6 mm wide. The back side is purplish or reddish-brown with an iridescent sheen, while the belly is pale in color. Original Distribution: Widely distributed throughout mainland Europe and the British Isles. Current Distribution: All of Europe, the United States, Canada, New Zealand, and Australia. Is probably distributed worldwide, but species may not be identified in all parts of the world. However distribution is patchy, depending on particular habitats. Often, these worms may be found in microsites such as urban gardens and desert oases. Site and Date of Introduction: First introduced by colonial settlers in the New England and Mid Atlantic regions. Has been continuously introduced up to present times. Mode(s) of Introduction: First introduction was probably due to discarding soil that was used as ballast in ships or from mud packed rootballs of transported plants. Ongoing introductions are completed through using the species as fishing bait, in home composting kits, in shipped agricultural and horticultural products, and in commercial applications such as waste management and land bioremediation. Reason(s) Why it has Become Established: Populations have probably become established because of the similarities between habitats found in both the United States and in Europe. Historically, there has been a lot of commerce between the two which has led to ongoing introductions. Also, glaciation in the Pleistocene era had eradicated native earthworms in the northern United States. In many introduction sites, there has been no competition from native species because of this glaciation extinction. Ecological Role: Is categorized as an endogeic earthworm. This type of worm typically lives in mineral soil and consumes both organic material within the soil and at the soil-litter interchange. Earthworm activity such as digestion, assimilation, excretion, and tissue breakdown affects nutrient mineralization. This particular worm feeds on richer sources of organic material in the earlier stages of decomposition. They are often found closer to the soil surface. Benefit(s): Are often seen as beneficial to soil processes, particularly in pastoral and agricultural settings. Earthworms increase the rates of plant litter decomposition. They are also important for decreasing the time for nutrients to be transformed into a usable form. They also increase plant nutrient uptake. Soil aggregation and porosity are improved. Infiltration of water is also improved when earthworms are present. Threat(s): May transmit plant and/or animal pathogens. They may house pathogens within their guts and the soil in which they were transported in. 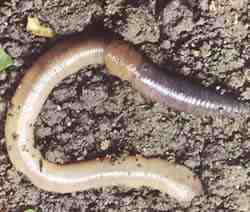 Earthworms have been known to be passive carriers or intermediate hosts for these pathogens. Also, these worms may contribute to erosion by removing and burying surface materials which originally would protect the earth from this process. They are also known to help disperse weed seeds in gardens and agricultural fields. Earthworms may help collapse irrigation ditches. They are also responsible for increasing the loss of soil nitrogen through the processes of leaching and denitrification. Soil carbon may be lost due to microbial respiration. These processes may be dangerous for habitats with no native earthworm species, such as the floors of forests. This earthworm is associated with extirpation of specialized plant communities found only in northern hardwood forests. One example of this is the decline of the rare goblin fern, Botrychium mormo, in the Great Lakes region. Control Level Diagnosis: Medium Priority, due to the recent decline of B. momo, earthworm introduction policies need to be considered. Importations are regulated by APHIS under the Federal Plant Pest Act. Because the earthworm is so largely distributed, they would be impossible to eradicate. They are also beneficial in many habitats. However policy changes may help prevent them from entering areas where they were previously not found. Control Method: Policy changes regarding introductions are the best way to control these species. Bans or restrictions on importations can be implemented. In natural habitats, greater abundance of earthworms are often found closer to roads and/or recreational areas. This is probably due to earthworm larvae living in tire treads (from vehicles associated with agricultural practices) and also because of fishing activity. If tires can be cleaned before leaving farms and a different type of bait can be used, introduction into previously uninhabited areas may be slowed. Coates, K. A., Wetzel, M. J., Gelder, S. J., Madill, J., and J. W. Reynolds. "The Aphanoneuran and Clitellate Annelida Occuring in the United States and Canada." English. 2003. [Online]. URL:< http://www.inhs.uiuc.edu/~mjwetzel/WONA2feb98.html >. "Earthworm." English. 2003. [Online]. URL:< http://www.fcps.k12.va.us/StratfordLandingES/Moran%20Website/mpages/earthworm.htm >. Goffman, P. M., Bohlen, P. J., Fisk, M. C., and T. J. Fahey. "Exotic Earthworm Invasion and Microbial Biomass in Temperate Forest Soils." English. 2003. [Online]. URL:< http://www.ecostudies.org/research/reports/grofpub1/paper_4_microbial_biomass_paper.pdf >. Gundale, M. J. 2002. Influence of Exotic Earthworms on the Soil Organic Horizon and the Rare Fern Botrychium mormo. Conservation Biology. Vol. 16 No. 6. Pp. 1555-1561. Hendrix, P. F. and P. J. Bohlen. 2002. Exotic Earthworm Invasions in North America: Ecological and Policy Implications. BioScience. Vol. 52 No. 9. Pp. 801-811. James, S. W. 2000. Earthworms (Annelida: Oligochaeta) of the Columbian River Basin Assessment Area. In: Quigley, T. M. [ed] 2000. Interior Columbia Basin Ecosystem Management Project: Scientific Assessment. Gen. Tech. Rep. PNW-GTR-491. Portland, OR: U. S. Department of Agriculture, Forest Service, Pacific Northwest Research Station. "Lumbricus rubellus." 2001. English. 2003. [Online]. URL:< http://meropslinks.iapc.bbsrc.au.uk/MeropsLinks/Speccards/sp000625.htm >. "Lumbricus rubellus. Hoffmeister, 1843." English. 2003. [Online]. URL:< http://www.sarep.ucdavis.edu/worms/profile7.htm >. Milius, S. 2002. Worm Attacks: Invading earthworms threaten rare U. S. fern. Science News Online. Vol. 162 No. 22. English. 2003. [Online]. URL:< http://www.sciencenews.org/20021130/fob5.asp >. Pickrell, J. 2003. Exotic Worms Killing Off North American Plants. National Geographic News. English. 2003. [Online]. URL:< http://news.nationalgeographic.com/news/2003/01/0102_030102_earthworms.html >. "Species Identification." English. 2003. [Online]. URL:< http://www.nurturingnature.co.uk/main/education-a.htm >.